What’s New for Concurrency in Java SE 8? Java SE 8 was officially released yesterday (March 18th) and given the fact that Java 7 was released back in 2012, there are definitely lots of updates and new features. These updates include improvements to the Java language itself, Java security, Java tools and more. Although a lot of these updates are interesting and important I am specifically interesting in exploring: What’s new for concurrency? With the increase in multicore processors there has been an increase in demand for concurrent programming and an increase in books and resources that focus on programming with concurrency. Below I will outline some of the books on my own bookshelf that have been useful. Parasoft JTest – commercial tool that combines static analysis and testing. Has capability to check for thread safety in multithreaded Java programs. Coverity Static Analysis and Static Analysis Custom Checkers – commercial tool that can be used to create custom static analyzers to find concurrency bugs in C/C++ programs. – Herb Sutter & James Larus, Microsoft. 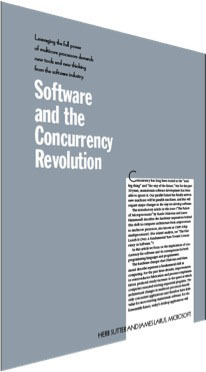 Software and the concurrency revolution. Queue, 3(7):54–62, 2005.